Only once a year can Atlanta residents experience a mansion exemplifying the holiday spirit. The Callanwolde Fine Arts Center, in collaboration with the South’s premier interior and floral designers, have transformed 27,000 square-foot home into the ultimate Christmas house. 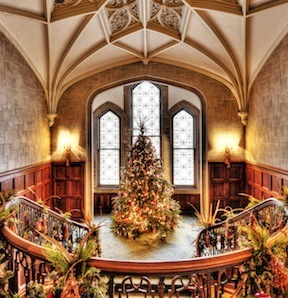 From now until Dec. 18, all day into early evening, guests can take in the beautiful furniture, designer treasures, fine art and breathtaking evergreen trees reflect the glorious era when the Candler family lived in the magnificent 1920s Gothic-Tudor mansion. Celebrate the season at our house this year with festive family activities, entertaining cabaret nights, holiday shopping and majestic music played on the Aeolian pipe organ. Special events include Battle of the Ice, cabaret nights, holiday shopping, an artists’ studio, even Breakfast with Santa and a Teddy Bear Tea for the kids. More information is available online for Christmas at Callanwolde. Tickets are $20 for adults, $12 for children (seniors and groups are only $15). Free parking and free shuttle bus service available one-half mile north at: Emory University Briarcliff Campus, 1256 Briarcliff Road, Atlanta, Georgia 30306. Proceeds from Christmas at Callanwolde benefit the continuing operation of nationally acclaimed Callanwolde Fine Arts Center, a non-profit organization providing fine arts programs including classes and performing arts to thousands of metropolitan Atlantans year-round. For more information check out Callanwolde’s Web site.